As the owner of a business, you become something of a public figure. This means you inherently have some measure of fame, of clout, of power. One mistake I often see people in this position making is failing to use that power. Your personal Facebook page has some of that power, even if you’re centering your marketing around your business page. Depending on how you naturally use your Facebook profile, you may need to make some adjustments. 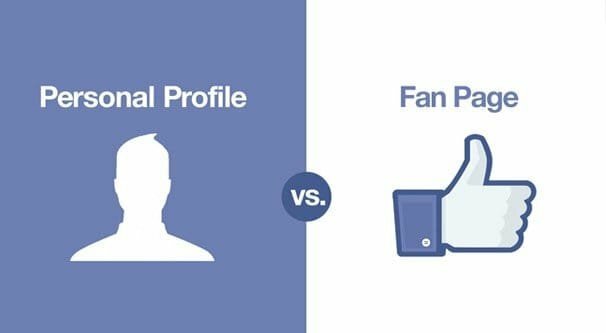 Using your profile for marketing is a potent tool, but you also need to be aware of how it may affect the people you’re friends with, your family, and your organic feed. You also need to be aware of the rules Facebook enforces with regards to business on their platform. Before we dig in too deep, I want to make one salient point that is often a point of confusion amongst readers and marketers. I know I’m somewhat inconsistent about the use of phrases like “Facebook page”, and for that I apologize. For the purposes of this article, a Facebook profile is your personal profile, and a Facebook page is a page-format account, usually for a business. If I refer to something as your “personal Facebook page”, what I mean is your profile. I’ll endeavor to keep the terminology straight, though. These days, Facebook doesn’t let you create a page without a profile. Pages generally have to be attached to a personal profile at some level, because that profile is the admin of the page. 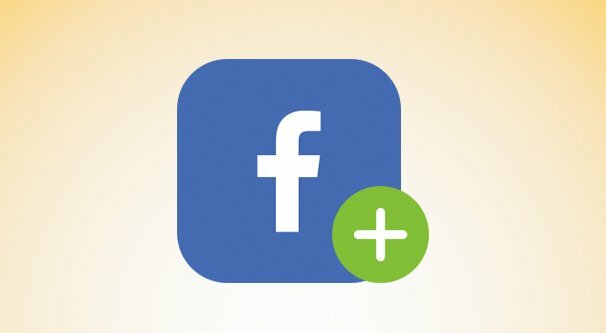 The only pages that don’t have profiles attached are either created specifically through the Facebook business manager or are legacy pages that have existed since before this change. The one rule Facebook enforces is “you may not use a personal profile for business.” While that sounds overly broad and, like other Facebook rules, inconsistently enforced, it’s not. Sure, Facebook doesn’t scan every single profile every day to make sure they aren’t businesses in disguise, but if you’re reported or they catch you in a casual scan, they’ll take action. In fact, if anything, Facebook is a little too overzealous in enforcing this rule. I know people who have been told their Facebook profile matches the activity of a business and have had action taken against them, even when they’re not running any sort of business at all. Thankfully, the penalty Facebook levies against profiles determined to be running businesses is not actually very strict. All they do is split your profile into both a profile and a page. If you’re not running a business, you’re free to ignore or delete the page, and keep your profile going as it was. 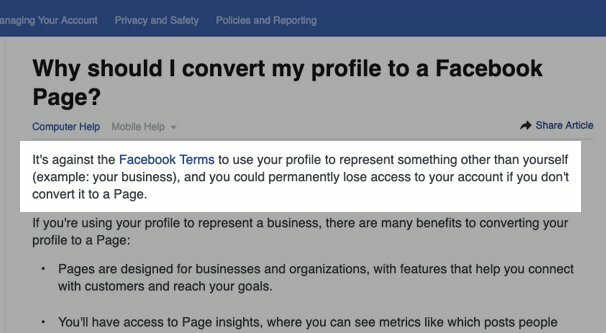 Now, of course, if you are running a business out of your personal profile, you should probably convert to a page anyway. Using a page gives you access to analytics, the ability to access the ads system and run ads to promote your page, and a wide range of engagement and marketing tools built into the platform. 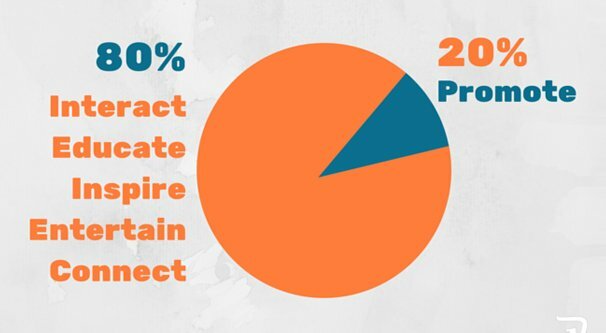 It’s simply much more effective than using a profile for business. If you’re trying to run a business out of your personal profile because you know your business isn’t acceptable as an actual business, like many MLM schemes, then you’re just out of luck. Frankly, if you’re running an MLM, it’s better to ditch it and start running a real dropshipping business instead. The marketing is virtually the same, but the overhead is dramatically lower and the profits dramatically higher. That is, you can actually make money, rather than losing it as 99% of everyone involved in an MLM does. There are quite a few small steps you can take to set up your profile and page to work together. I recommend doing as many as possible if you’re serious about using your profile as another marketing channel. First of all, you should probably adjust your profile information and privacy settings. Most of your profile information is probably public enough, but you may want to adjust a few things. Make sure your profile photo is a picture of you, generally a smiling headshot is the best. Photos of you in a speaker role or in a public venue are also good options. Make sure any career information or other public information is real, and is something you don’t mind strangers knowing. Get rid of any of those “CEO at My Patio” or “Education: The Streets” entries that people often add as jokes that stopped being funny in 1995. Consider your display name. Most people just use firstname lastname, and that’s fine. If you have your middle name or your maiden name in your profile, consider changing it. Maiden names are especially worth hiding, since they’re frequently information used in phishing or as security questions. Only keep your middle name if it’s part of your personal branding and distinguishes you from someone with a similar or the same name. In your About section, add a link to your business page, along with a short description of what your business is, what your role in the business is, and a call to action. Now take a look at your security settings. What you want to do is set up a situation where your actual friends can still see and interact with you as normal, but you’re also somewhat available to others who might choose to follow you. Set up some basic security. I recommend enabling Facebook’s two-factor authentication. This way if you need to log in from a new location you can, but you’re protected against someone compromising your information and attempting to log in. Set up trusted contacts. If you somehow lose access to your account, setting a friend as a trusted contact gives you another method for recovery. This needs to be someone you can contact from outside Facebook, and hopefully they will never be called on to help. Here are some security settings I recommend changing. Make your username something that reflects your name, rather than a joke name. Enable security alerts for unrecognized logins. 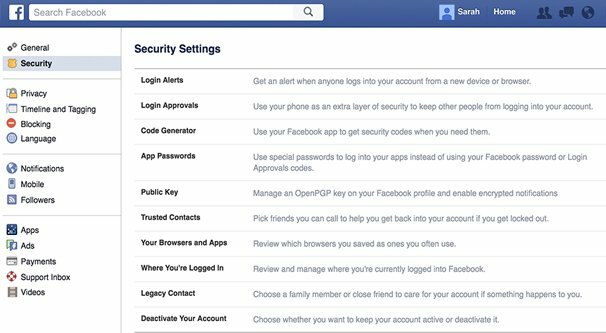 Set specific devices as authorized, if you never use more than 1-3 specific devices to access Facebook. Set your future posts to “public” privacy. This ensures anyone who wants to view your profile can see anything you post publicly. Limit past posts to friends-only, in case there’s something in your past that someone might dig up and want to use against you in some way. Allow friend requests from anyone, but make sure that you manually review them and only accept friend requests from people you want to be friends with. Now, moving forward, every time you make a post on Facebook you need to decide whether you want the post to be public or private. By default, your posts will be entirely public. 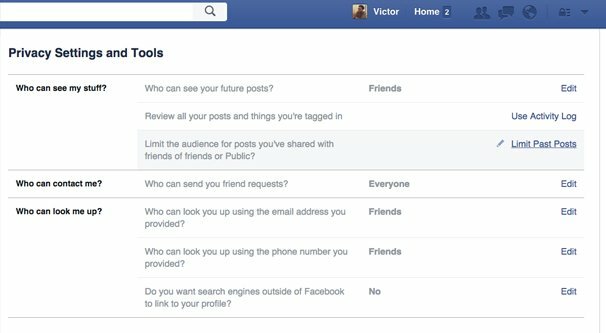 If you want to post something specific to your friends and family, but you don’t want casual customers to see it, change the post privacy to friends only when you post it. Additionally, set “review tags” in the security settings. This way, when friends and family tag you in posts and post to your timeline, it’s not shared publicly with your business customers. You can still post about your fun weekend vacation without jeopardizing your professional image. All of the above is laying the groundwork and setting the stage. As you know from running a business though, there’s a lot more to it than just building the shell. You need to take the right actions for people to show up. One thing you should avoid doing is posting about your business every day. You probably learned this lesson when you first launched the business, but if not, it’s still a valuable lesson to take to heart. The more you post about your business, the less your friends and family are going to pay attention to your posts. You’ll be annoying them with something that, while they probably approve of in general, they don’t really care about. An occasional post about your business is good, but you should keep those posts to certain kinds of topics. Remember that you’re not directly marketing on your profile, you should save that for your page, and moreso save it for your website. Instead, here are some kinds of posts you can make on your profile. Post photos of places you go or situations you find yourself in that leave you inspired. Anything from some local art or a local event to a trip you took for business or pleasure. Remember that these should be semi-professional; you don’t need to hire a photographer, but a blurry camera phone picture from a train window might not cut the mustard. Post sneak peaks or ideas for future products or features for your main product. You can use the public reaction to gauge how much of a success that kind of idea might be, or to build hype in a product that you’re already working on developing. If people can follow your personal profile for sneak peeks at the future of your business, they’ll be more likely to do so. Reporters in particular are generally interested in this kind of post. Post behind the scenes elements of your job or your business. What is it like in the back room? How do your workers tend to spend the day? What do you do when you get down to the nitty gritty of it all? Giving people a glimpse behind the curtain is always a good way to boost customer engagement through feeling like they have more of a connection with you. Use live video or simple video to unbox new prototypes or the first of a new product to show it off, show how great it is, and share the in-the-moment excitement that is so common with people who follow the owners of businesses. They’re hype, you’re hype, so share in that hype to build more hype. Share a powerful customer review or testimonial with your friends, family, and audience. You can’t always find a way to feature a user testimonial on your brand page, but you can share it on your personal page both as a way to show off to friends and family and as a way to engage more people and get them to leave their own testimonials. It’s personal recognition from the owner of the business they like; that’s a heck of a reward. Link to your content on your website, when it’s appropriate. Sharing your blog posts every day is likely to be at least somewhat annoying, but if you keep it sporadic for just the best posts you write, that’s usually a good way to capture attention. The key here is to be a person, not a brand. We always talk about humanizing your brand for maximum engagement, but by being the person behind the brand, you can be even more personal. You’re not just showing a glimpse of the man behind the curtain, you’re doing away with the curtain entirely. That’s usually a pretty good place to be. It shows you’re comfortable with showing what’s going on behind closed doors, while also allowing you to curate what people are able to see. You can build up quite a following, and use that following when you start a new business.